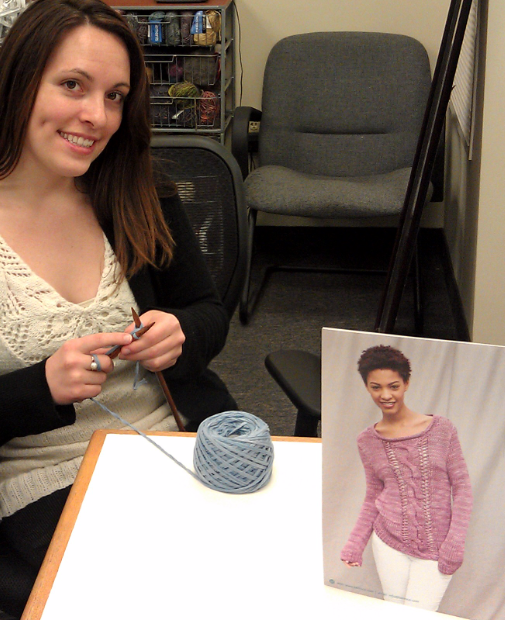 I was really excited to get to work today and cast on for our Berroco Karma Knit-Along! So excited, in fact, that I forgot my needles at home (mental head slap). Off to a great start! Luckily, we have plenty of spares in the design office. I borrowed a pair, I wound my first hank and cast on (way too tightly, I might add). Before I go any further, I should probably explain that this is not just my first time leading a knit-along…it’s my first knit-along period. So to recap, I have no needles and no experience. It should be an interesting month! Things went more smoothly once I got into the pattern stitch. By the fifth row, I had a good rhythm going and I was even starting to predict the next step. I love this pattern! I hadn’t paid much attention to the design details prior to casting on, so I found it very unexpected but at the same time very logical. I’m also really enjoying working with Berroco Karma! It’s not my first tape yarn, but Karma’s mesh construction is so unique and interesting to work with. I quickly noticed that I’d forgotten a k2tog. I knit through the entire pattern once without issue and decided to do it once more before finishing for the day. I was at the end of row 19 when I realized I had four stitches remaining instead of two. I looked back and found my mistake – a missing k2tog in the second repeat. When it comes to lace or eyelet knitting, I’ve found I really have to say each stitch in my head to prevent ripping out. I hate ripping out lace! This way, I still forget the occasional yarn over, but when I say it the next time, I realize it’s been a while and find my mistake. I had started out this way, but I guess I got sloppy. More accurately, I was distracted by certain people in the design office (cough, Amanda) talking about food. Are you planning to participate in the Berroco Karma Knit-Along? Check out the Berroco Lovers forum on Ravelry for more details. I’ll be posting regular updates and pictures I as work on my Herbie! Previous article Ask Amanda: What’s the difference between Fair Isle and intarsia?